Born with the name Abid bin Aboe Ghoffar Dja'far or EBIT G. Ade in Wanadadi, Banjarnegara 21 April 1954, was the youngest of six siblings, children Aboe Dja'far, a civil servant, and Sauda, ​​a cloth merchant. He had harbored a lot of goals, such as engineers, doctors, painters. Everything is off the mark, even so Ebiet singer - although he prefers to be called a poet because of her background in the arts that originated from kepenyairan. After graduating from elementary school, Ebiet entry PGAN (Education Teacher of Religious Affairs) Banjarnegara. Unfortunately he was not at home so moved to Yogyakarta. Schools in SMP Muhammadiyah 3 and proceed to the SMA Muhammadiyah I. There he was active in the PII (Indonesian Islamic Student). However, he was unable to continue studying the Faculty of Economics, University of Gadjah Mada in the absence of cost. He prefers to join the vocal group when his father gave him a retirement option: FE UGM Ebiet entry or sister who passed the exam recently finished an undergraduate at the University General Sudirman, Navan. Name Ebiet gained from his experiences in high school English classes. His teacher foreigners, used to call her Ebiet, perhaps because they say A to E. Inspired by the writings on the back Ebiet red shirt, long Ebiet he is often called by his friends. His father's name is used as a last name, abbreviated as AD, then written Ade, as the sound of their mention, Ebiet G. Ade. If extended, written as Ebiet Ghoffar Aboe Dja'far. Often wander frivolous, first Ebiet familiar with the young artist Yogyakarta in 1971. Apparently, that has shaped the preparation Ebiet to orbit. Motivation greatest creation that evokes creativity of his work is as friendly to Emha Ainun Najib (poet), Eko Tunas (short story), and EH Mammal (the author). Malioboro become a home to Ebiet when gait kepenyairannya processed, because at that time many artists who gathered there. Although able to make a poem, he admitted that he could not simply recite poetry when requested. Of his inability to read the poem directly, the Ebiet find a way to still be able to read the poem in a different way, without having to declaim. How, by using music. Musical poetry, as the term is used in the kepenyairan, as many have done in poetry Sapardi Djoko Damono. Some poems are sung Ebiet Emha even with the passage of his guitar. However, when it entered the studio, not a grain of poetry was sung Emha participating. It happened because he had been teasing his friends to make a song of poetry itself. Racing spirit of his friends was whipped Ebiet to sing his poems. Ebiet first learned guitar from his brother, Ahmad Mukhodam and learning guitar in Yogyakarta with Kusbini. At first he was just singing with art performances held in Senisono, Patangpuluhan, Wirobrajan, Yogyakarta and Central Java, memusikalisasikan poems by Emily Dickinson, Nobody, and received a positive response from the audience. Even so he still considers kegiataannya as a mere hobby. However, at the instigation of the closest friends of PSK (Persada Study Club founded by Umbu Landu Paranggi) and also his one kos, finally Ebiet willing also moved into the world music scene archipelago. After repeatedly rejected in various record company, he finally accepted at Jackson Record in 1979. If Ebiet originally reluctant to leave the bungalow is not far from the cabin palace, the fact has been pointed straight path for him to Jakarta. It was through tape after tape with success. Had he also did the recording of the Philippines to achieve better results, ie, Camellia III album. However, he refused to record the songs in Japanese, when he got a chance to appear in public in there. Once also he made the recording at Capitol Records, USA, for the 8th album of his day. He includes Addie M.S. and Dodo Zakaria as colleagues who helped his music. The songs become a new trend in pop music khasana Indonesia. Not surprisingly, Ebiet time to dominate pop music in Indonesia in the range of 1979-1983. About 7 years Ebiet doing recordings in Jackson Record. In 1986, a company record that catapulted his name was closed and Ebiet forced out. He had set up their own record company EGA Records, which produced 3 albums, Attract Sun, Moon Sketch Gold, and a face. Unfortunately, in 1990, Ebiet an "edgy" with Indonesia, finally selecting "penance" of the music industry was frenetic and choose to stand on the periphery. New in 1995 he issued the album Paper Butterfly (backed by Ian Antono, Billy J. Budiardjo (late), Purwacaraka, and Erwin Perry) and Love-clear Dew (powered by Adi Adrian of KLa Project). In 1996 he issued the album I Want to Return (supported by Purwacaraka and Embong Rahardjo). Two years later he issued Gamelan album containing five old songs re-arranged with gamelan music by Rizal Mantovani. In 2000 Ebiet dispense soap opera ballad album Love and in 2001 he issued a language album Heaven, which is supported by Andi Rianto, Erwin Gutawa and cultivation. After that album, Ebiet began again to retreat over the next 5 years. Ebiet is one of the singers who support the album We For Them, an album released relating to the 2004 tsunami, along with 57 other musicians. He was a specialist tragedy singer, his songs often proved to be the theme of disaster. In 2007, he issued a new album titled In Love: 25th Anniversary (supported by Anto Hoed), after a 5 year recording hiatus. The album itself is a warning for wedding anniversary 25th of his, along with 13 other songs are also still in the old arrangement. Ebiet reappearance on 28 September 2008 in Zone 80 event at Metro TV quite a remedy for the fans. With the companions of whom attended Eko Tunas, Ebiet G Ade old rendition ever popular in the decade of the 80s. Ebiet known songs with the theme of nature and the grief suffered marginalized groups. 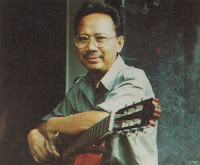 Through his songs are ballad genre, at the beginning of his career, he was 'shooting' atmosphere of Indonesia in the late 1970's to the present. Theme song variety, not only of love, still there are also nature-themed songs, socio-political, disaster, religious, family, etc.. The touch of his music had pushed an update on the world of Indonesian pop music. All songs written by him, he never sang the song that created another, except the song Navigating the blessings God authored with President Susilo Bambang Yudhoyono. Segara "Dega" Banyu Bening (born December 11, 1989). They reside in the Ciganjur, Jagakarsa, South Jakarta. Ebiet eldest son, Abie also has musical talent, and often represent Ebiet sound system in check ahead of his gig. Ebiet also an avid golfer, but since the devastating tsunami of 2004, he never again play golf. Not all albums released Ebiet G. Ade contains new songs. In recent years, he often re-release issued biggest hits, both with the original arrangement and the arrangement again. And in recent years Ebiet many chose to collaborate with talented musicians. The number of compilation albums released studio album exceeded. So far there are at least 25 compilation albums issued by various record companies. 18 Golden and Platinum Records of Jackson Records and other labels from the album Camellia I to Issues! A number of awards from various independent institutions.